Rav Chaim Kreiswirth, zt”l, said a similar thing based on a statement on today’s daf. “In Niddah 66 we find that when a woman went to Rav Yochanan requesting help about a problem that was particular to women he suggested that she ask other women to daven for her. On the surface, this seems strange. We know that our sages say that when one has a sick person in his home he should go to a chacham and request that he daven for the sufferer. Yet here we find an exception to the rule. Instead of the chacham alone davening, he sends her to other women to petition that they daven for her. Although the gemara cites that she is like a metzorah who should tell the many to daven for her, it seems odd that he said specifically to tell other women to daven for her. But is it true that our prayers or more effective when “intoned wholeheartedly,” to quote another part of the “story off the daf?” I believe this is true. Haven’t there been times when you attempted to pray for another only out of duty and not because you really cared? Maybe a person asked you to pray for a situation that you didn’t believe was terribly serious. Maybe you even said you’d pray for them and then completely neglected the matter. How would such lackluster prayers or no prayers at all help anyone? Yesterday was Tisha B’Av, a day of tremendous grief among the Jewish people; a day that marks many terrible tragedies for the Jews, including the failure of the generation of Israelites who left slavery in Egypt to enter into Eretz Yisrael and take possession of the Land. It is also the date on which the Holy Temple in Jerusalem was destroyed and the Jewish people were sent into exile for nearly 2,000 years. Our Sages explain that the people, who lived at the time of the Temple’s destruction by the Romans learned Torah, did misvot and performed acts of kindness. Why was the Temple destroyed? Because of sin’ at hinam–baseless hatred. Jealousy and selfishness created differences in people. ”Why does he drive such a nice car and I pray that mine will start every time that I put the key in the ignition?”–”I work so hard and do everything with impeccable honesty, so how come his business is flying and mine can’t show a profit?” Questions like these are at the root of baseless hatred. They doubt the correctness of G-d’s “distribution system”. You might even go so far as to say that they reveal a lack of Faith! It may surprise many Christians to realize that the destruction of the Temple and the exile of the Jews wasn’t due to a lack of piety or religious observance. The religious practice of the Jews in Israel in those days was above reproach. But, according to midrash, the sin of baseless hatred of one Jew for another was very great and indicated a lack of faith among the people. How can even impeccable acts of piety and holiness be truly effective if faith is diminished by hatred? How can prayers be effective and invoke a response from God if our trust in Him is small? I don’t say all this to “bash” the ancient or modern Jewish people but to illustrate that we Christians can suffer from the same lack of faith, devotion, and intension as Jesus is describing. We can all suffer from a lack of empathy for our fellow human being. But what about empathy and true intension in prayer? According to Rav Chaim Kreiswirth, the person who will offer up the most sincere prayers to God for our suffering is the one who has suffered similarly. A woman who labors under difficulties that are unique to women, according to this principle, should seek out other women to pray for her. Let’s apply this to the Jews and Tisha B’Av. Although the many horrors that the Jews have suffered was technically observed yesterday, because yesterday was also the Shabbat, the fast was not observed. Today is when religious Jews all over the world will allow themselves to fast, to pray, to grieve over their long history of trials and anguish. And so it has been for thousands of years –the mazal–luck– of the Jewish people has been bad on that night– the night of Tisha B’Ab. The first and the second Temple were destroyed by gentile armies –on Tisha B’Ab. The city of Bitar was raped and pillaged and hundreds of thousands of our gentle brethren were slaughtered on Tisha B’Ab. The Jews were expelled from Spain and England–on the night of Tisha B’Ab. The terrible history of the destruction of Judaism in Europe at the hands of the Nazis y”s, began with the political upheaval of World War I, which, not coincidentally, began on the night of Tisha B’Ab in 1914. Why do we mourn on Tisha B’av? Why not come to terms with the fact that the Holy Temple is gone, accept G-d’s judgment, and make the best of Jewish life without a Temple? Isn’t it an essential Jewish value that we should accept G-d’s decrees? Well, yes, that is true for all of G-d’s decrees — except the destruction of the Temple. For nearly 2000 years, Jews have sat on the floor, weeping through the stirring descriptions of Jerusalem’s destruction and the tragedies faced throughout their history in exile. Every day they have prayed for a rebuilt Jerusalem. These demonstrate an intense national longing to reunite with G-d’s Presence, in a way that could only be felt in the Temple in Jerusalem. When lovers are separated, their bond is shown in their yearning to return to each other. That thirst to reconnect with G-d is the true essence of Tisha B’av. In my previous commentary on Tisha B’Av, I suggested that Christians should also mourn the loss of the Temple because in a way, it’s our loss, too. The Jews will see the Temple rebuilt only when the Messiah rebuilds it. For a Christian, that means the Temple will be rebuilt upon the return of Jesus Christ (I know many Christians believe what Jesus will build is a “spiritual” Temple and not the physical structure, but I have no problem believing that the Throne of the Messiah will one day exist upon the Temple Mount in Jerusalem). But upon reflection, I wonder how can we mourn with empathy what we don’t understand? How can Christians or anyone but a Jew, actually “feel” the loss of the Temple, the loss of connection to God that the missing Temple represents? 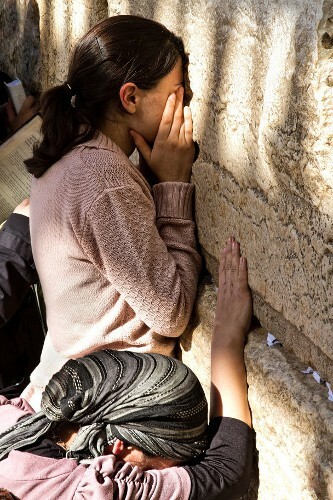 On Tisha B’Av, many, many Jews travel to the Kotel, what some call the “Wailing Wall” in Jerusalem, the last remnant of Herod’s Temple that Jews are allowed to access (since they are forbidden to ascend to the top of the Temple Mount and pray), and pour our their tears, their prayers, and their hearts to God, begging for the coming of the Moshiach and for God’s grace and mercy to rain upon His people Israel. 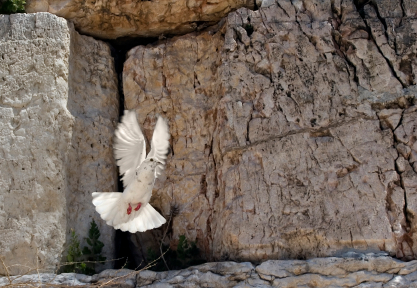 How can we Christians even begin to understand what Tisha B’Av means? How can we pray for the Jews? How can we mourn along side of them? I do know that some Christians do (though not as many as I’d wish). I know some believers have turned their hearts to God and to the Jewish people, they have turned to the east to face Jerusalem…and they have cried bitter tears as they see the grief of the Jews and they have allowed their hearts to melt and bleed. Today is Sunday, and most Christians will be headed off to church this morning. They will pray in their sanctuaries and in their Bible classes. They will pray in their homes and with their families. I only ask that some of you reading this morning’s meditation allow a double meaning to your prayers and petitions to God as His Holy Spirit calls to you. I would not have you weep any less for that charming, good and handsome Christian. I only ask this: that as the great cold surrounds my bones, you allow a double meaning for your mourning veil. And when you let fall your tears for him, some few will be… for me. The love of Cyrano’s life, the beautiful Roxane, was in love with another, the handsome cadet Christian de Neuvillette. Cyrano, although incredibly accomplished, felt no woman could ever love him because of his ugliness. Toward the end of the play, de Neuvillette has died and Roxane is in mourning. Cyrano asks not that she cease her tears for the “charming, good and handsome Christian,” but only that he might consider that, at his own death, some portion of her sorrow could also be for him. The irony is at the play’s end, Roxane confesses her love for Cyrano as he is dying in her arms. How many of us, like Cyrano, deny ourselves our heart’s desires believing they are unattainable when in fact, they are at our very fingertips. Perhaps our sincerity and devotion in prayer is like that. We have only but to look in the right direction, to open ourselves to God and to see the Jewish people with new eyes. Maybe we only need to exchange our heart of stone for one of flesh. 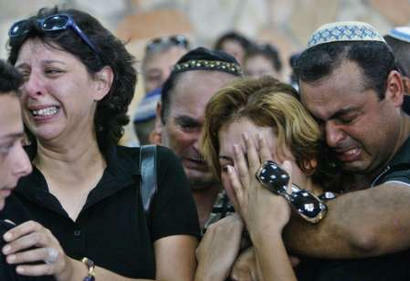 And then, as Jews weep and fast and immerse themselves in pools of sorrow, some few of us can shed our tears with them. Any human being can climb higher than this world. But it’s not a flash from above that will take you there. Every day, from the time you open your eyes until the time you close them, teach your eyes to see the world as it is seen from above. Previous PostTisha B’Av: Longing for Goodness and RighteousnessNext PostHow Can We Love The World?